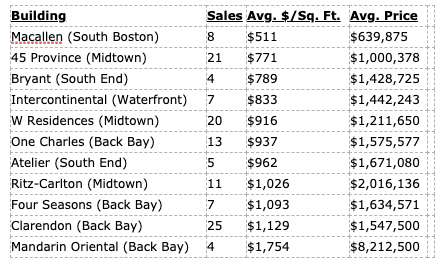 After taking a client out to view several luxury condos in Boston this week, I decided to write a post comparing the sale prices in some of the major luxury condo buildings in Boston. The data was compiled from LINK and the sales are from January 1, 2011 thru September 1, 2011. Not surprisingly, the cream of the crop is the Mandarin Oriental as it's the most expensive luxury condo building in Boston. Many of the wealthiest Bostonians call this address home. The entire list of luxury buildings in Boston is much more extensive than this, but I wanted to spotlight some of the well known properties in several neighborhoods.